Just like any fish or pet, snails come in all shapes and sizes, colors and designs. Snails can live for a good amount of time, around three to five years. But, in an aquarium setting, they can live for up to 10 years in ideal conditions. Many different species have intricate shells, so fish owners want to add them in their fish tanks. Some pet fish owners debate on whether snails make good editions to their aquariums. Aside from their beautiful shells/homes, many freshwater aquarium snails are actually beneficial. How to Care for Snails in a Freshwater Aquarium? These snails benefit your aquarium and the surrounding fish just by being in the same tank! They help increase the good bacteria in your tank and also add a pop of new color to their surroundings. Snails are especially helpful in taking care of the cleanliness of the tank. They remove harmful substances from the glass walls, as well as the bottom of your aquarium. Snails do this by naturally cleaning up the tank and digesting most of the waste. This includes things like leftover fish food, unfiltered fish waste, and rotting leaves. Some snails are phenomenal at cleaning up the substrate, or the material used on the bottom of the tank. They do this by eating away the detritus and other organic material that accumulates. Having less leftover gunk means you don’t have to clean the bottom of your tank as much. Adding snails to your aquarium helps you, your fish, and the appearance of your tank in more ways than one. If you’ve decided that you want a freshwater snail in your aquarium, you might be at a loss about where to look for one. You don’t have to pull on your boots and go searching in the pond, but you do have the option of looking online. Here is a small list of possible snails you can choose from. Nerite snails are one of the best starter snails because they’re very good at keeping the tank clean. 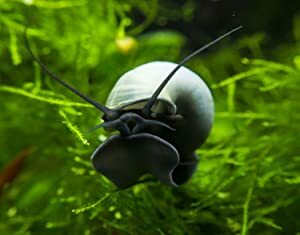 They consume algae at rates that beat almost every other snail. They also have lovely stripes, making them perfect for adding zing to the décor of your aquarium. Because snails breed surprisingly fast, many pet fish owners don’t add them to their tanks. But that problem’s solved with these nerite snails. They only reproduce in brackish water, so they’re perfect for freshwater aquariums. Another good quality about these nerite snails is that they’re very friendly. They’re compatible with most live plants, fish, and shrimp. They’re definitely great to add to liven up the fish party in your aquarium. Next up, are the Golden Mystery Snails. True to their name, Golden Mystery snails fit perfect with bright colored corals and fish. They’re very friendly in that regard, so you don’t have to worry about their safety or the surrounding fish. Golden Mystery snails are unique because they grow to be some of the largest aquarium snails. All they need to thrive is the leftover food of your fish or really any waste or organic material. 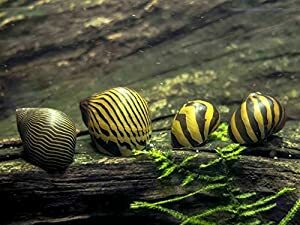 Golden Mystery snails are a great option if you’re looking to add freshwater snails. They’re readily available, easy to take care of and reduce the amount of time you have to spend cleaning the tank. If you want a snail that blends into the back, but still does a great job of cleaning up, the Blue Mystery Snail is perfect. 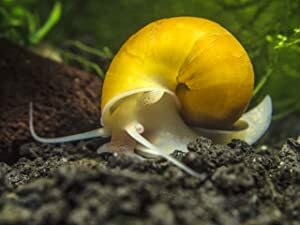 This snail is similar to the Golden Mystery snail, but a different color. The Blue Mystery snail helps keep your substrate clean by eating away any residue left on it. This also keeps the substrate in the correct color that it’s supposed to be. One thing to take note of for these snails is that you should keep your water level a little low for them. They need to come up for air a couple of times, so they climb up the side of the tank. If the water level is too high, it’s more difficult for them to get sufficient air. Other than that, these snails are perfect for any freshwater tank. 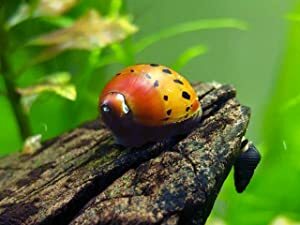 Let’s say you want to add a snail that has a bit more of fancy design. Then the Tiger Nerite snail is your go-to option. This snail is a dark amber color and has small black stripes in rows across the back. The Tiger Nerite snail makes a great addition to any tank because it sits well with other fish and plant life. You don’t have to worry about it eating your plants or other small fish. One thing you should be careful of is the copper level of your water. As most snails are sensitive to copper, the Tiger Nerite snail can get very sick and even die with high levels. This is something to be wary of if you use tap water to source your tank’s water supply. If you have to use tap water, try using a pH balancing solution to keep the water at a good pH level. If you’ve taken care of that, then get ready to welcome the Tiger Nerite snail because it’s perfect. The Ivory White Mystery snail is the perfect combination of ivory and white with an added soft sheen. If you want a thoughtfully designed aquarium, these snails make the perfect addition. Although these snails grow to be very large, they’re best suited to live with small to medium size fish. Large fish tend to get aggressive around other large snails and fish, so stick to smaller ones. Aside from leftover fish food, this snail also eats blanched vegetables. They enjoy zucchini, cucumber, and kale, among other things. 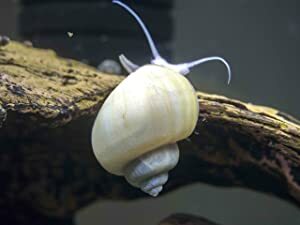 Adding the Ivory White Mystery snail to your tank is a great way to neutralize any harsh or boring colors. Not only are they useful aesthetically, they also help clean your tank. It’s a win-win situation for you. This next snail is completely different in its shape. While other snails are circular, the Japanese Trapdoor Snail has a spiral-shaped shell. This snail shell also has a variety of markings, making it perfect for colorful aquatics. The Japanese Trapdoor snail does an excellent job of cleaning up the glass and substrate of a tank. Aside from leftovers, this snail also enjoys eating invertebrate pellets and vegetables. Although it has a bit of a spooky name, the Black Devil Snail is actually quite docile. This snail’s shell ranges in color from a chocolate brown to a deep black, hence the name. 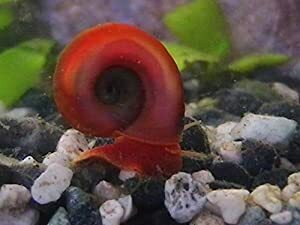 The Black Devil snail is an active member of the snail community, so it moves around quite a lot in an aquarium. It’s sure to keep your tank sparkling for the most part because of how much it moves around. These snails also enjoy eating live plants, so keeping those in the tank with them isn’t such a good idea. 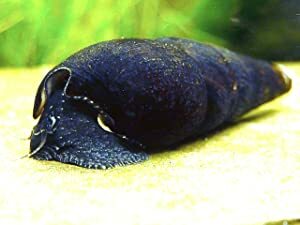 Besides that, the Black Devil snail is a good choice for freshwater snails. The next snail is one of the more quirky ones. Assassin Snails are known to be feisty towards other snails but are harmless to fish. 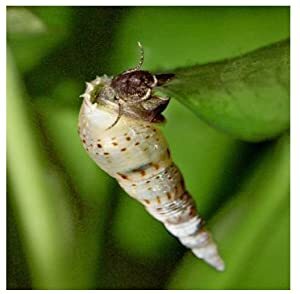 They control and eat pest snails, like bladder snails and pond snails. They usually attack and eat snails that are smaller or the same size as themselves, but steer clear of the big ones. These snails also love to burrow themselves, so having a good substrate is key to their survival. Assassin snails do a fantastic job of getting rid of pests. So, if you already have unwanted snails in your tank, these are the ones to get. For a brilliant pop of color, you can add a few Bright Red Ramshorn Snails. These snails add a fiery red appeal to any tank and are perfect for colorful backgrounds and fish. The Bright Red Ramshorn snails are some of the hardiest snails. They aren’t picky about their water parameters and reproduce easily. If you don’t want overpopulation, it’s recommended to closely track their breeding patterns. Alternatively, you can buy other snails that eat them to naturally handle the problem. 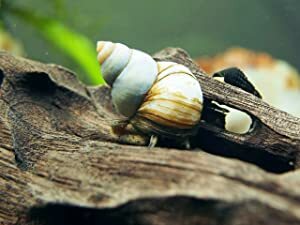 Malaysian Trumpet snails make up the most common snails in aquariums. These snails are arguably best at removing waste compared to others. Malaysian Trumpet snails are only interested in their food, so living plants are safe. In fact, the waste they produce from eating actually acts as a fertilizer to your plants. They are easy to care for and available at low prices, making them a great option. Once you decide which snails to include in your tank, it’s important that you understand how to care for them. Buying a snail is less than half of the work. Preparing the tank, buying appropriate food, and creating the ideal environment is imperative. One of the most important things to take care of before adding your snail is the water quality. If you already have fish in your tank, you’ve probably already taken care of this. Snails need hard water or water that has a lot of minerals in it, to live happily. The minerals in the water help to keep their shells sturdy and healthy. While snails are very tough creatures, the pH levels can also affect how active they are. If you have too much copper in your water, this negatively affects your snails and can even cause death. Treat your water with a pH balancer before adding in any snails to ensure it’s a safe level. Allow at least two days before adding in your aquatic pets to give the water time to settle. It’s also important to consider the lifestyle your snails live. Some snails prefer to burrow in the ground, while others like to stay on top of it. This information is important because it gives you an idea of the type of substrate your snail needs. Some substrate materials include sand, gravel, or even a combination of both. Doing research and talking to an aquatic specialist can help guide your decision. Once you know what type of ground to create, you can shop for good substrate material accordingly. If you want to add snails to your aquarium, you need to make sure you have a good welcoming party. Don’t add snails to fish tanks populated with aggressive or very large fish. Snails are generally timid and these large fish can harm them or even eat them within a few hours. This also works the other way. If you have very small or baby fish in your tank, medium or large snails won’t hesitate to eat them. No one likes rude neighbors, so make sure to research which fish are compatible with the snails you want to add. Speaking of fish eating fish, there are some species that readily eat aquarium snails. Obviously, these are the fish you don’t want to have in your tank if you plan on adding snails to it. Fish like the Pufferfish and Clown or Yo-Yo Loaches enjoy eating snails, so be wary of them. Likewise, Labyrinth fish, like Bettas and Gouramis, also enjoy eating snails for meals. They’re actually very good at catching them, even if they burrow under gravel or sand. You can also ensure that you don’t have predator fish in your tanks by speaking with an aquatic expert. They can inform you about the specifics of your tank and if you have to remove some fish before adding the snails. Taking care of any pet is a big responsibility and snails are no different. Once you make the decision to add them to your fish tank, you must prepare and be vigilant in caring for them. They may be small, but they play a big part in keeping your tank thriving and sparkling clean! I recently discovered my snails love brussel sprouts. Not so much Kale. It does need to be anchored some how though as they float.